-Providing information & guideline to dealer for conducting service promotion activity like reach camp, free check up camp, etc. -Consistently Achieved Business targets of Service Visits, Parts & Accessory, Value Added Services in consecutive years-Management Appreciated with Performance Award of Exceed Expectation(A+) in FY 13-14 & FY 14-15 First Half. Enhancing service Quality by improving skills of manpower at Head and Secondary networks in Assigned territory, established 12 secondary networks in 6 months for gaining more customers and providing doorstep support to rural customers. 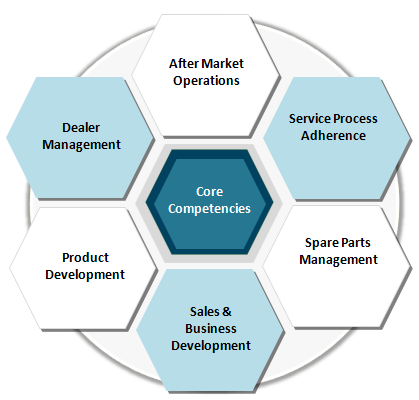 Improving parts consumption by understanding customer need and providing high end service quality to customers, Maintaining parts inventory at Head and Networks as per ABC Analysis.